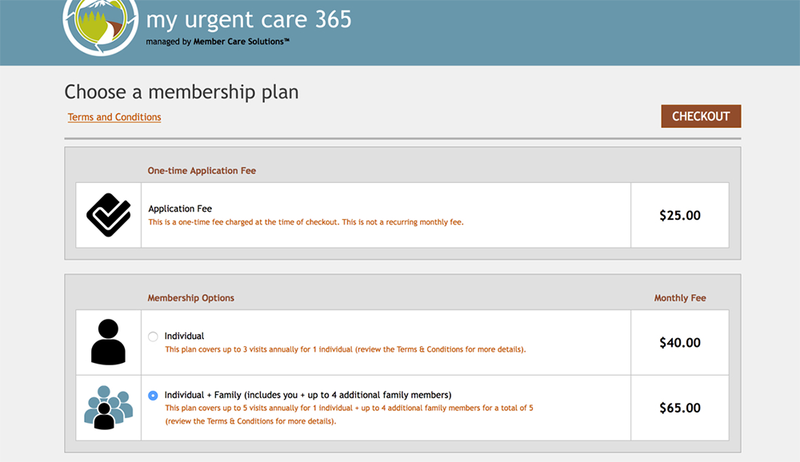 Patient Memberships is one of the fastest growing revenue segments in the Urgent Care industry today, and MemberCareSolutions is the software to power it! Ask a Question or Schedule a Demo! Take back control of your patient care from the insurance companies by offering membership options your patients can afford! With insurance costs continuing to rise, individuals, families and their care providers are desperate for alternatives and Member Care Solutions has the answer! MCS is a cloud software solution that allows care providers to fully mold, deploy and manage their own in-house membership program that is specific to both the care needs of the patient and the business needs of the provider. MCS was designed from the ground up with the help of industry leaders to streamline the implementation and management of Urgent Care membership programs, as well as Direct Care or Direct Primary Care programs (also referred to as Concierge Medicine or DPC) for Doctors and Physicians. Sign up new members via your own custom branded enrollment page. No modifications needed to your existing website or internal systems. In fact, you don't even need a website at all to use our platform! Simply set up a computer in your facility's waiting room with your custom enrollment page link (provided when you sign up) open in any web browser and you're ready to enroll new members! Set your own membership plan pricing & options. You are in complete control! Add as many membership plans as your program design calls for, and set the prices for each plan so they make sense for your business. Even set individual terms and guidelines for each membership plan independently. New membership plans and modifications to existing plans are instantly reflected on the Member Enrollment Page! See key program data on demand! One of the most important elements of a successful membership program is knowing how it's performing at all times. 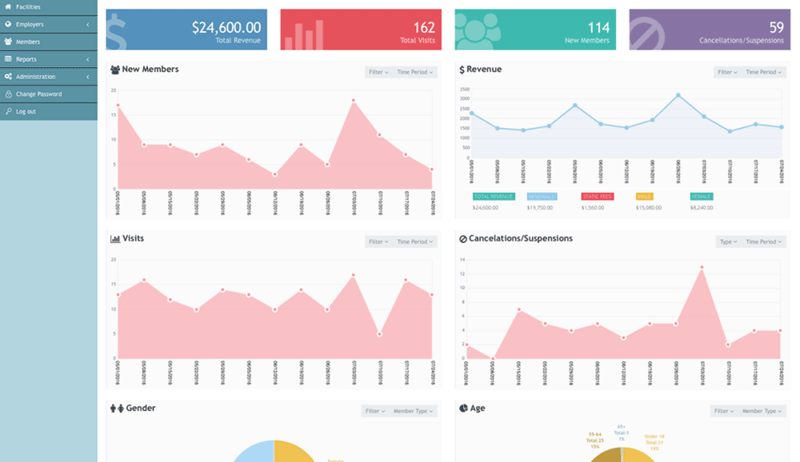 Our unique graphical reporting dashboard shows you key program metrics in a single easy to read graphical dashboard. Simply choose a date range, and quickly view revenue data, membership details, and even demographical statistics. Custom branded member portal for your members. Your members are always just a login away from important details related to their account such as visit usage stats, family member details, payment information, and more. Plus, the Member Portal is branded with your company name and logo so your members are confident they're in the right place. No website development or coding experience needed. In fact, you don't even need a working website to use our service! 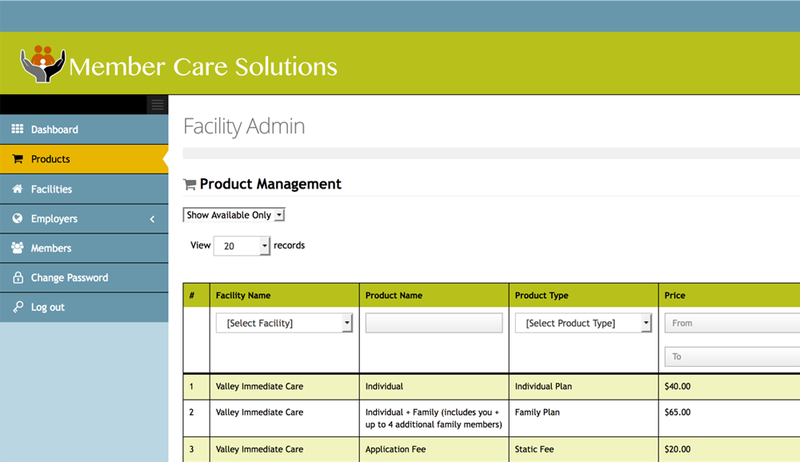 Built specifically for the patient care environment with intuitive Member lookup, visit reporting and accounting features. Create as many membership plan options as you desire, with custom pricing and configurations unmatched by any other membership service, period! We’ve automated many of the time consuming processes and tasks associated with manually managing a membership program including monthly credit card billing, and member notification emails and reminders. Real-time reporting on every aspect of the program, from enrollment statistics to revenue, and even demographical details. Our system grows with you! Whether you have one facility or 300, 100 members or 100,000, our system can accommodate your needs now and in the future. Enroll employees from local businesses into your membership program with ease using our built-in corporate sign up tools. MCS is the first and only DPC system to offer a robust set of network features, allowing (at your option) your members the flexibility to visit other networked MCS client facilities when they travel. 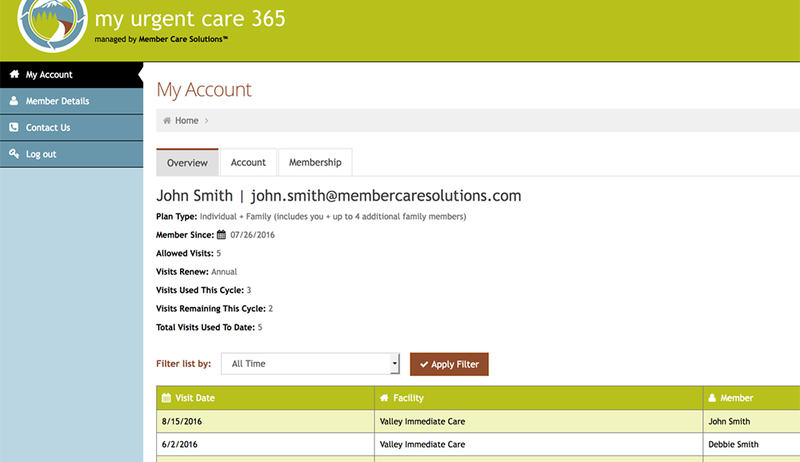 Contact a Member Care Solutions representative today to schedule a LIVE demo of the entire system and start enrolling members in as little as 7 days! Simply click the button below, enter your name, email address and phone number, along with some basic details about your practice, and we'll contact you within 24 hours.